plaque, tarter, dentists, preventive dentistry, in-home dental care, fluoride and oral hygiene. START SAVING DENTAL DOLLARS NOW! 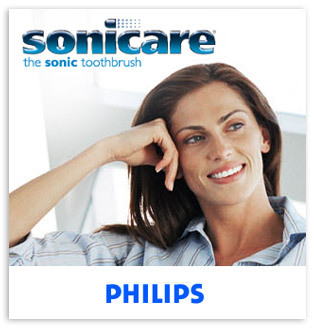 SONICARE® Essence the sonic toothbrush. Patented sonic technology creates high speed bristle motion and dynamic fluid cleaning acton. Extra soft bristles with contoured head - extra-soft end-rounded bristles are gentle on teeth and gums. Advanced contoured head with slim, angled neck for enhanced maneuverablilty. Easy-start® gently increases power over first 12 uses to ease into the Sonicare experience. Smartimer® 2 minute timer helps ensure dental professional recommended brushing time. Quadpacer® 30 second interval timer encourages thorough brushing of each quadrant of your mouth. Recharge indicator light provides battery charge status and blinks to alert you when to recharge. Inspired by the sonic technology used in dental offices. Developed in collaboration with university researchers to help reduce and prevent gum disease. Ideal for travel. Fully charged Sonicare® will last for up to 2 weeks of normal brushing. 2 Sonicare handles + 2 Brush heads! The Sonicare Elite was found to be safe on soft tissue and effective in the removal of supragingival plaque. 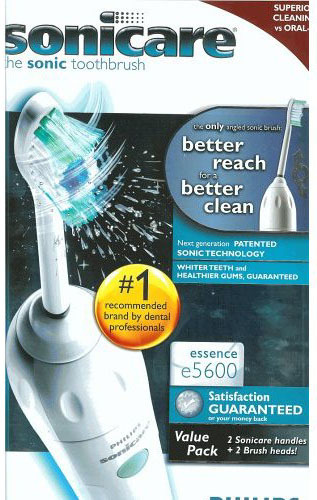 Sonicare Elite was found to remove significantly more plaque than a manual toothbrush. The Sonicare toothbrush was as effective or better than the manual toothbrush in reducing plaque and bleeding scores in patients with implants. The Sonicare toothbrush was proven superior to a manual toothbrush in improving periodontal health in adolescent orthodontic patients. In addition, a significant decrease in subgingival gram-negative bacteria in the Sonicare toothbrush subgroup was observed. Sonicare Elite significantly reduced gingivitis and plaque over a 12-week period. The use of the Sonicare toothbrush on a routine basis by recall periodontitis patients led to reduced pocket depth of 18.1% and 20.5% after 3 months of use. The Sonicare Elite was shown to remove biofilm 2-3 mm beyond the bristles. The Sonicare toothbrush significantly reduced pain associated with dentinal hypersensitivity between 35-40%. Use of a Sonicare toothbrush is helpful in the treatment of saliva hypofunction (xerostomia/dry mouth). Bad Breath and Gingivitis | Is Your Dentist Taking Shortcuts? 10 Tips for Keeping Your Teeth Healthy for Life!